Tall-kneeling exercises are the natural go-to for glute firing . . . but which ones? Alwyn Cosgrove brings you into his thought process. Somebody already gave the answer, but I want everybody else to think about it. I put her in kneeling. If I put her in tall-kneeling, the quads are on stretch. They can’t give me the stability. Her hamstrings are short and they can’t give me the stability. I can coach the lower back, so I get the core and the glute firing. I do the medicine ball throw from a tall-kneeling position. The goblet squat, I like that. Did the lunge problem change that? I may do a split-squat from the bottom up with the TRX—an assisted split-squat. The hinge and push-up aren’t a problem. The TRX row, I may do rowing half-kneeling with the cable. The anti-rotation press is a great choice. I would do that in standing, right? No. That was called a trick. I take you in a direction and bring you back the other way. I would do the anti-rotation press in tall-kneeling. Is that overkill or is it 12 pounds in three weeks and the happiest client you’ve ever met? That’s the juice, right? That’s the secret. The FMS is my secret weapon. 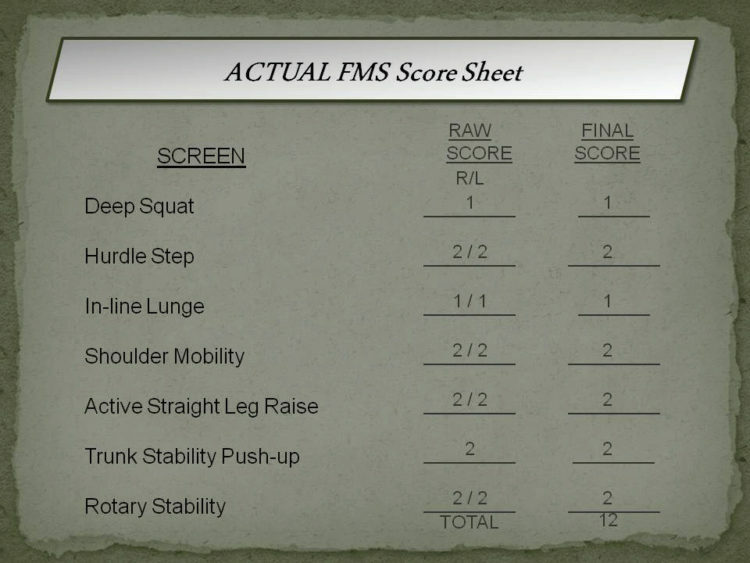 Cook, Cosgrove and Burton delve into case studies to explain how the Functional Movement Screen is an asset when creating individualized programs.